Hillside, NJ – May 14, 2018 – WizKids is excited to announce a new game that puts the Fun in dungeon, Fungeon Party! Designed by Brian Lewis, David McGregor, Marissa Misura, and Tom Jones, this is a fast-paced, quest completion game which takes a traditional dungeon party and puts them in a truly untraditional dungeon crawler. 2 to 5 players pick a class from a list of classic adventure choices; such as Barbarian, Cleric, Ranger, and Wizard, just to name a few. Each class has their own stats, which can be upgraded as experience points are earned, as well as a special ability that will help the party complete a pile of at least 6 quests. Quest cards are drawn from a stack and placed in the middle of all players. Using a cell phone or stopwatch, a timer is set for 30 seconds per quest, so 6 quests would be a 3-minute timer. Someone yells “GO”, the top quest card is flipped over, and the goal is to complete all quests before the timer runs out! Sounds simple, but is it? What types of quests would you expect in a Fungeon? Stack dice on your forehead, bounce dice into the box, knock down a meeple surrounded by dice, balance a meeple on a stick. These and many more wacky quests await the brave adventures that travel through the corridors of a Fungeon! Gather your party and check out this quick, easy, and FUN game to learn and play! 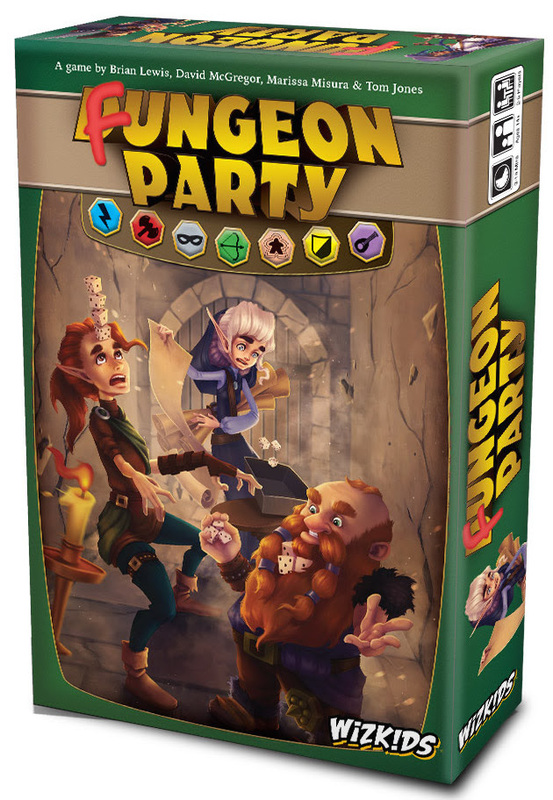 Fungeon Party will be available at your Friendly Local Game Store June 2018 for $29.99. Pre-order today!